According to Richard Dorment at the Telegraph, “You’d be hard-pressed to find a painting that doesn’t hold your attention in this superlative new show” in the Queen’s Gallery which according to Dorment is on a roll with several excellent exhibitions. The exhibition demonstrates that clothes worn during the renaiisance by the royal sitters often served a double function: as a visible sign of status, wealth and power, of course, as well as a means to establish or reinforce political identity. From the Queen’s Gallery “ In Fine Style: The Art of Tudor and Stuart Fashion provides an insight into the world of the rich and famous of the 16th and 17th centuries. The exhibition includes over 60 portraits from the Royal Collection, as well as rare surviving contemporary examples of clothing and accessories. A number of works go on display for the first time. In the Tudor and Stuart periods, even armour followed fashion. The ornate set belonging to the 13-year-old Henry, Prince of Wales (c.1607) was designed to echo the full breeches and V-shaped doublets of the day. The armour was a gift from a French nobleman and a statement of great extravagance, particularly since the young Prince would soon have outgrown it. Heir to the English and Scottish thrones, Henry died of typhoid fever at the age of 18, and his younger brother succeeded him as the ill-fated Charles I. 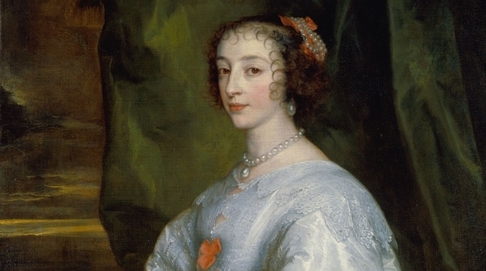 Other works on display include a gold and diamond signet ring given to a young Henrietta Maria Queen by her husband Charles I in around 1628, three years after their marriage, and Mary II’s patch box made of enamelled gold set with diamonds. In the 17th century, black fabric patches were stuck to the face to emphasise the creamy white skin of the leisured class and to conceal blemishes. They were applied using saliva or adhesive and produced in a variety of shapes, from crescents and flowers to animals. This entry was posted in Art, Book Tickets Now!, Exhibits, Museum, Other London Things. Bookmark the permalink.